TO RECEIVE THE LATEST NEWS AND TOUR DATES. August 16, 2013 — Well-known entertainer Cheech Marin, who has gained additional acclaim as a collector of Chicano art, is scheduled to visit the University of Wyoming campus and present two public programs on Sept. 6-7. Marin will speak about “Chicano Art: Cultivating the Chicano Future” at 4 p.m. Friday, Sept. 6, in the Wyoming Union Ballroom, followed by a book signing. On Saturday, Sept. 7, at 10:30 a.m., he will give an informal gallery walk-through at the UW Art Museum. Both programs are free and open to the public. An opening reception to celebrate the exhibition is planned Friday, Sept. 6, from 6-8 p.m. at the UW Art Museum. This event also is free and open to the public. While on campus, Marin also will meet with faculty members and students from the Chicano Studies, American Studies, Art and History departments. Marin, who is best known for his work in movies, television and improvisational comedy, has been acquiring art for more than 25 years and has amassed arguably the most renowned collection of Chicano art in private hands. A selection of paintings from Marin’s private collection will be on view at the UW Art Museum Sept. 7-Nov. 23. “Chicanitas: Small Paintings from the Cheech Marin Collection” features paintings all under 16 by 16 inches, and showcases 26 established and emerging Chicano artists. The painting styles include photo-realism, abstraction, portraits and landscapes. The exhibition and Marin’s visit are made possible in part by the Wyoming Humanities Council, Wyoming Cultural Trust Fund, Wyoming Arts Council through the Wyoming State Legislature and the National Endowment for the Arts, UW Chicano Studies, UW Multicultural Affairs, UW Student Activities Council, UW Art Department, Wyoming Institute for Humanities Research, ASUW, MEChA, UW National Advisory Board Endowment, and UW Art Museum Gala funds. For more information, call the Art Museum at (307) 766-6622 or visit http://www.uwyo.edu/artmuseum and the museum’s blog at www.uwyoartmuseum.org, or follow the museum on Facebook at http://www.facebook.com/uwyoartmuseum. Through its “museum as classroom” approach, the UW Art Museum places art at the center of learning for all ages. The museum is located in the Centennial Complex at 2111 Willett Drive in Laramie. Hours are Monday through Saturday from 10 a.m.-5 p.m. Monday hours are extended to 9 p.m. February through April and September through November. Admission is free. 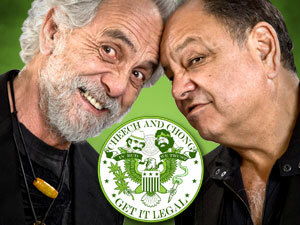 On November 16th, the Cheech and Chong: Joint Venture tour is coming to the Emerald Queen Casino in Tacoma, Washington. Don't be confused with the Up in Smoke tour which includes the bands WAR and Tower of Power. This is just Cheech and Tommy. It's actually better because it's just comedy, instead of bouncing back and forth between comedy and music. The other format was confusing. The KJR-FM pre-sale is tomorrow, August 14th at 10am local via the ticket link above. We don't know the passcode so listen to the station or go to their site to find out. The general sale is Friday. “Desperate to save the world, (and his job), the creator of Earth journeys to the planet to reconnect with mankind- via an internet variety show.” Billed as an irreverent comedy with a heart, the film offers an entirely fresh interpretation of the divine. “It’s a rebellious call to action that endeavors to inspire a troubled world through humor and music”, said Gerald Brunskill, the film’s writer and director. He credits, Neale Donald Walsch’s best-seller, Conversations with God as the inspiration for writing the script. The movie also stars Rebecca Mader of ABC’s Lost fame who recently appeared with Robert Downey Jr. in Iron Man 3. The movie is written and will be directed by first-timer Gerald (Jerry) Brunskill and will be produced by Brunskill’s Wow and Flutter Media Group which he helms with Partner and Producer Ryan Rees. Rees will Produce along with Adam O’Connor. Ruchir Garg will Executive Produce and Jennifer Birn is casting and co-producing. It’s Gawd! marks Chong’s first full-length feature since 1984’s, “Cheech and Chong’s the Corsican Brothers” and will be the first time that he appears in a starring role without his long-time partner, Cheech Marin. Chong, who spent nine months in a federal penitentiary for selling bongs and marijuana pipes was last featured in “aka Tommy Chong”, a documentary film that chronicles his experience and is critical of the prosecution of Chong by the U.S. federal government. “This movie is going to surprise and resonate with a lot of people,” Chong ads. Cameras are set to roll in September of this year in Los Angeles. Thomas B. Kin Chong is a Canadian-American comedian, actor, writer, director, activist, and musician. He is well known for his marijuana-themed Cheech and Chong comedy movies with Cheech Marin, as well as playing the character Leo on Fox’s That ‘70’s Show. Gerald Brunskill is a writer, director, and composer. He has scored hundred hours of episodic television and has also written and directed several television pilots. He is currently involved in multiple projects in both the scripted and non-scripted space. This will be his first full-length feature as director. Wow and Flutter Media Group is a full-service production company that Brunskill and Rees launched in 2006. WFM has been involved in the production of over 30 films including, “The Wackness” starring Ben Kingsley and Josh Peck, “Tyson”, a documentary about Mike Tyson, and “World’s Greatest Dad” written and directed by Bobcat Goldthwait and starring Robin Williams. This DVD is only available here. Super rare!. We have the largest selection of Cheech and Chong merchandise on the web. Our store is packed with brand new shirts, fuzzy dice, action figures and much, much more. Some shirts are now in XXL. Contact us to order items by the case. Looking For Cheech and Chong song lyrics? Copyright Traced, Inc. All images copyright to their respective owners. All rights reserved.. Awesome Inc. theme. Powered by Blogger.